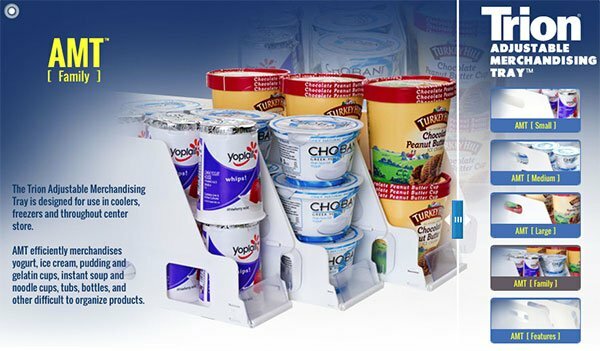 Tame Unruly Products with Adjustable Merchandising Trays for dairy, freezer and center store. AMT is designed for yogurts, ice cream, pudding and gelatin cups, instant soup and noodle cups, tubs, bottles, and other difficult to organize products. Adjusts from 2 11/16″ to 3 5/16″ wide for 4-6 ounce yogurt cups and similar small products. Adjusts from 3 5/16″ to 3 15/16″ wide for 5-6 ounce greek yogurt cups and mid-range offerings. Adjusts from 4″ to 4 5/8″ wide for tub, pint, 1 1/2 pint, ice cream and large containers. Built-in manual feed which quickly and conveniently forwards and faces product, then tucks out of sight into the tray. Lift Out Trays with easygrip handles to allow quick restocking of dated product or cleaning of shelves. Adjustable Width that tailors to a broader range of products, improves look and operation, allows re-use in new plan-o-grams and merchandising. Adjusts in 1/8″ increments. Built-in Carry Handles to allow quick re-organizing of product categories, restocking or cleaning. Built-in Ventilation to improve refrigeration air circulation. Paddle Extension available for stability and better forwarding of tall or multi-tier products. Snaps onto paddle. Top Tier Sidewall available for support and containment of tall or multi-tier products. Snaps onto sidewall. Optional Label/Sign Holders offer a protected home for product and price information, improve product navigation and sales. Optional Promotional Flag to improve product promotion navigation and sales.